this was sent to me by a classmate. the alumni association is looking for photos, videos, etc for a dvd they are making for the 75th anniversary - memorial day weekend 2014. spread the word. "The MHS Alumni Association would appreciate your help in collecting email addresses of as many alumni as possible so information about the 75th Anniversary can be sent to them. Please send names and email addresses of alumni you may know, to any of the contacts listed below. Mahalo." 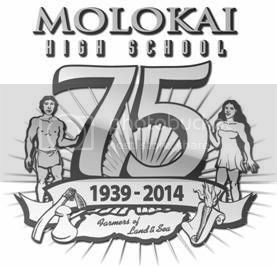 "You can never start too early," says an organizer of Molokai High Schools 75th year Anniversary. Indeed the group is already planning a 60 minute retrospective DVD, and has finalized the event logo six years ahead of the celebration. The design uses updated elements from the schools current logo depicting the slogan "farmers of land and sea," and was developed by MHS 1993 graduate, Todd Yamashita. Event organizers say the logo will be used on T-shirts, DVD covers, and event publications.